9mm ovals with three flat sides. 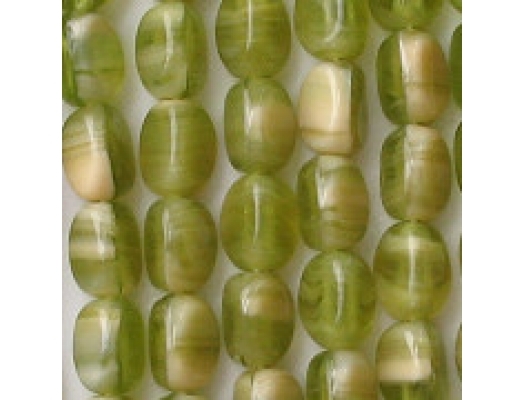 These are pressed beads; the flat sides are not facets. 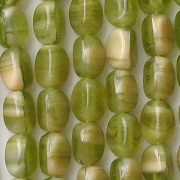 Loose horizontal swirls of translucent olive green and opaque cream or beige. IMPORTANT: While handling these beads in March 2017, I noticed that some of the beads have cracks, perhaps 10% to 15%. Consequently, I took 20% off the price. 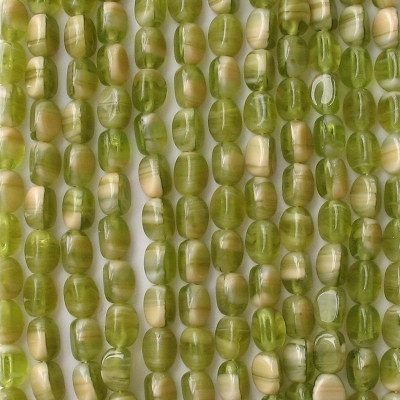 When using these beads, you should inspect each side of each bead to eliminate the ones with cracks. I love this color combination. I got these beads from my most expensive supplier at a nice discount. Please note that the picture is a little dark; the actual beads are a bit lighter, especially in daylight.